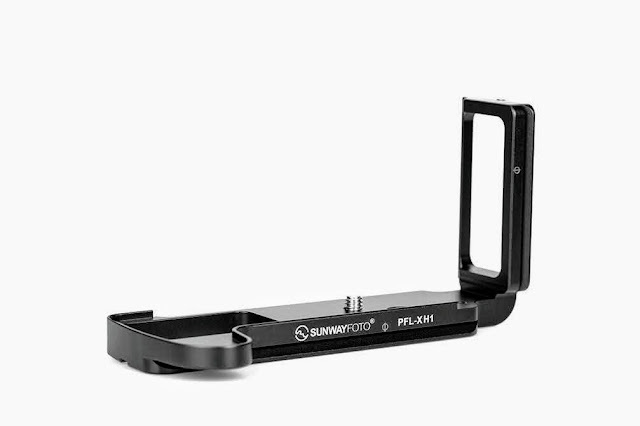 A completely new design of a Low Profile and astonishingly light weight panning clamp, has been introduced by SUNWAYFOTO. 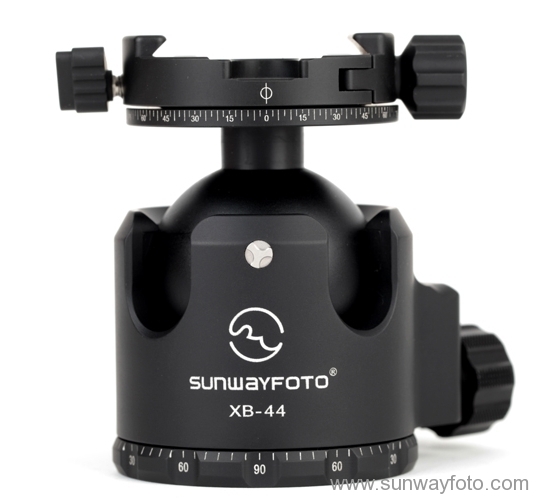 DDH-02 does not replace the existing DDH-01 but complements Sunwayfoto's Panoramic clamp range towards the lower end. It is designed to fit their smaller ball head models in mind like the DB-36, DB-44 and the newer FB-44 and XB-44 Low Profile. The stainless steel rotator-core and the high contrast bubble level are dominant when looking from above. The rotator core is counter sank in order to accept a flat head screw for attachment on a ball head, while the bubble level is embedded in one of the safety stop relief grooves. The clamp screw knob and the panning lock lever are short and close to the clamp minimizing the total width. There are 2cm long decimal scales on both jaws, the first cm closer to the center is marked in 1mm increments at either side of the 0 (center) point, followed by a mark at 2,5mm distance. Somehow, although the jaws' length could have been 4cm it has been decreased to only 24mm. The only reasoning I can see is in order to lower the weight a few grams more. Nevertheless, the top plate is quite longer than the jaws, which will adequately support and balance a camera plate or a nodal rail but I still have some reservations for the ability of the small jaws to clamp securely heavier gear without vibrations. Even at first glance, it is obvious that great effort has been made to minimize size and weight in designing the DDH-02 panning clamp. The size is very compact and the weight of 74gr is unbelievably low even lower than the Sunwayfoto DLC-42 Duo Lever/Knob Quick Release Clamp which I had reviewed last March. 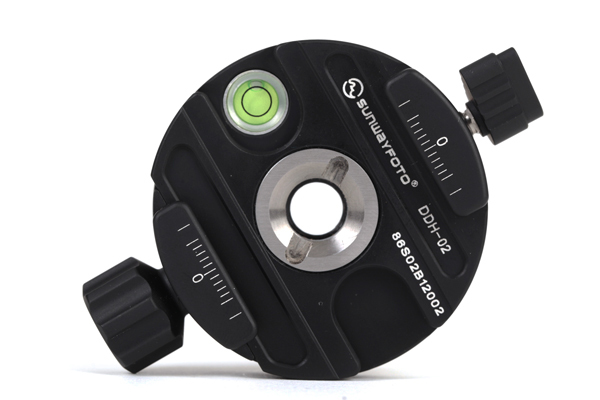 The screw knob and the panning lock lever have CNC machined grooves and lack any rubber coating according to the Sunwayforo standard by now. 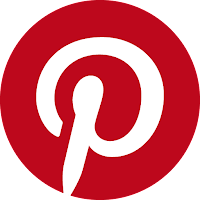 The choice of a lever for locking the panning base, is far better than a small knob, since it will permit the application of more force to the locking screw, with less effort from the user. Two Φ Index pointers for the panning scale are found at opposite sides bellow the relief grooves. Their positioning marks also the longitudinal middle axis between the clamp jaws for proper camera/lens alignment. I don't know if this position is really functional, as I fear that the index marks will be obscured after clamping a camera or a nodal slide rail on top, other than a very short one that will reach just to the panning clamp's edge. 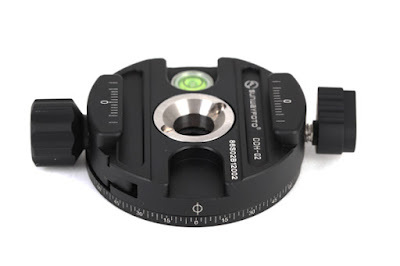 There are two deep safety stop screw relief grooves, one at each side, permitting a motion at either side into the clamp, for better camera/lens plate alignment. Any possible excess material has been carved away from the clamp's top surface in order to lower the weight more. There are quite visible laser engraved markings every 2.5o and numbers every 15o. However, the numbering is not continuous from 0-360o but increases from 0o to 90o then decreases back to 0o and so on, same as on the panning base of most ball heads. Actually this is the main difference between the DDH-02 and the larger DDH-01 which has a panning scale form 0 to 360o. The center hole has a 3/8"-16 thread and the usual alignment/ant-twist grooves on the sides for attachment on a ball head stem with compatible islands (bosses). The panning base is very slim and shows that any excess material has been carved off in order to minimize weight as much as possible. 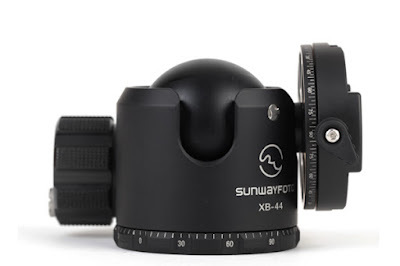 The slim DDH-02 seems to fit well on top of the Sunwayfoto XB-44 Low Profile Ball Head, reviewed last month. 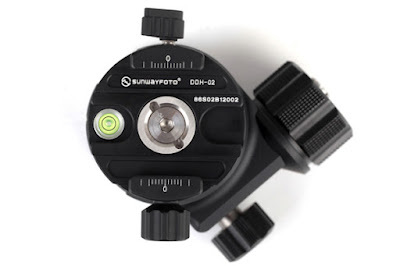 With the DDH-02 clamp the total height of the ball head is increased just by 2,8mm to 81,8mm instead of the 79mm with the standard screw knob quick release clamp. This small raise in height is very minimal in order to affect the geometry of the ball head whatsoever. 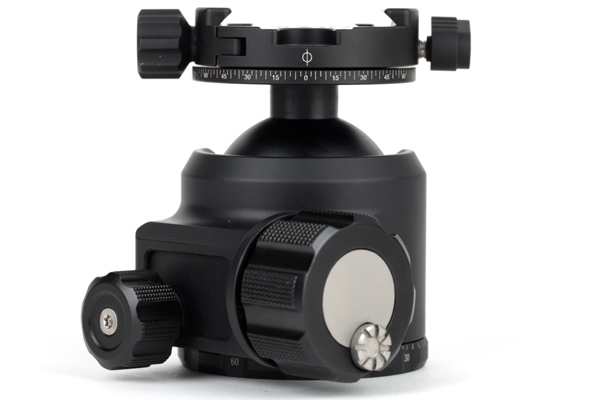 The ball head can be purchased with DDH-02 panning clamp fit as model XB-44DDH or later upgraded by purchasing the DDH-02 separately. The DDH-02 Panning Clamp is attached on the XB-44 ball head, by the use of an M6 stainless steel screw. So even if it is purchased as an upgrade for the XB-44 QR clamp, it is very easy to exchange clamps. Due to the low profile of the XB-44 ball head, the panning lock lever, may impose a restriction in tilting the head fully into one of the drop notches, in case the head is mounted on a flat top tripod without a center column or the center column top plate is larger than the head's base. 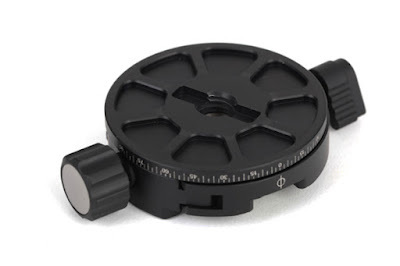 On the other hand DDH-02's circular shape seems to be the answer to the limitations imposed by the original XB-44 quick release clamp's corners hitting against the ball head panning base and/or the oversized Friction/Lock knob, as I had noted in my XB-44 ball head review. DDH-02 can be tilted fully and rotated withing one of the XB-44 drop notches without any obstacle. DDH-02 is a great example of design and machining indeed, with my congratulations to Mr. Ma -Sunwayfoto's senior designer - who seems to win the race for compactness and light weight. However, as I mentioned in the beginning, I hold some reservation for the clamp jaws length which seem a little small to me for handling larger and heavier gear with an offset center of gravity like in panoramic photography, as well as for the positioning of the panning index marks. But this is only speculation as I will only be able to test and judge its sturdiness, resistance to vibration and functionality after a hands on test. 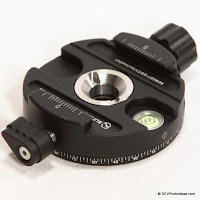 Full Sunwayfoto DDH-02 compact Panning Clamp Review and implementation ideas. 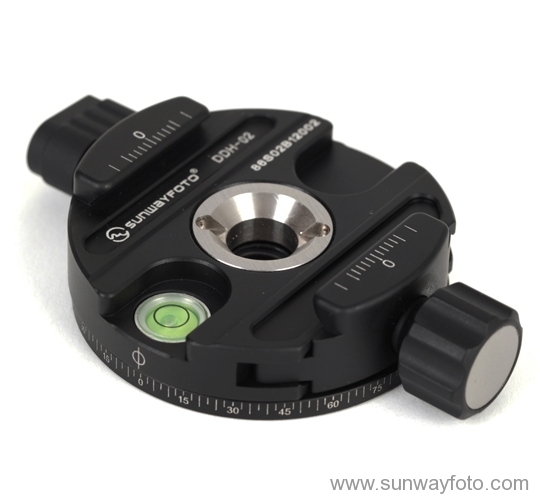 DDH-02 Panning Clamp has been replaced by the New Improved Sunwayfoto DDH-02i Panning Clamp.